Girl, glaring back with no comment. I just don’t know what to believe! I do a lot of tweeting (my husband calls it “twitting,” which sometimes seems appropriate). No one has ever asked about how I got into Twitter, but I want to share the story. A few weeks ago I blogged about my friend who got me into blogging (in 2004 I started a personal blog read by only my mom and my sister, which I updated through last year). Well, that friend is the exact same person who introduced me to Twitter. She got an account pretty early on. I looked around on Twitter after she told me about it. It didn’t seem like it was my thing so I didn’t get an account at first. I didn’t want to give status updates to people I didn’t know. But after a couple months, I figured I would get an account too, mostly because I wanted to follow people who were famous (Mark Bittman, Rick Bayless, Yoko Ono, Venus Williams, Andy Roddick, Al Gore, Dooce, Anderson Cooper (side note: yum), Augusten Burroughs, Oprah, and on…) Yes, I have a personal Twitter account that I used for a short while with about 150 followers. It’s a protected acct, but don’t worry: I no longer tweet there (too busy for two accounts). I started a Twitter account for Fed Up With Lunch because I liked that Twitter had a broader scope than Facebook, but it was more “anonymous.” Since I am anonymous, that feature lined right up with my initial goals. I thought about starting a Facebook account for this project, but I didn’t want it to be found by my coworkers who are on Facebook. Although there are tons of people on Twitter, only 2% of my real life friends are on Twitter compared to 98% of them are on Facebook. Now I use Twitter more than I use Facebook. I still don’t have an official Facebook account for the blog project (but there are two imposter ones — shaking my fist at weird strangers!). I’ll probably start up a Facebook account for the blog, but I’m still in no hurry. I enjoy tweeting because it’s fun to connect with people who are interested in similar topics (food, education, school lunch, parenting, etc). They are people I would never have met without having a Twitter account. Also I credit my Twitter account for making Fed Up With Lunch a successful blog. It’s the PR department! Recently (10/16) one of my tweets was on the front page of Twitter. That was really cool. It was a quote that was retweeted more than 30 times: “Farming looks mighty easy when your plow is a pencil, and you’re a thousand miles from the corn field.” ~Dwight D. Eisenhower Too damn true! I was curious, what kind of cookie is it? Why didn't you eat the buns? The cookie looks like the sugar cookies my students get. They aren't bad and they aren't super sweet. 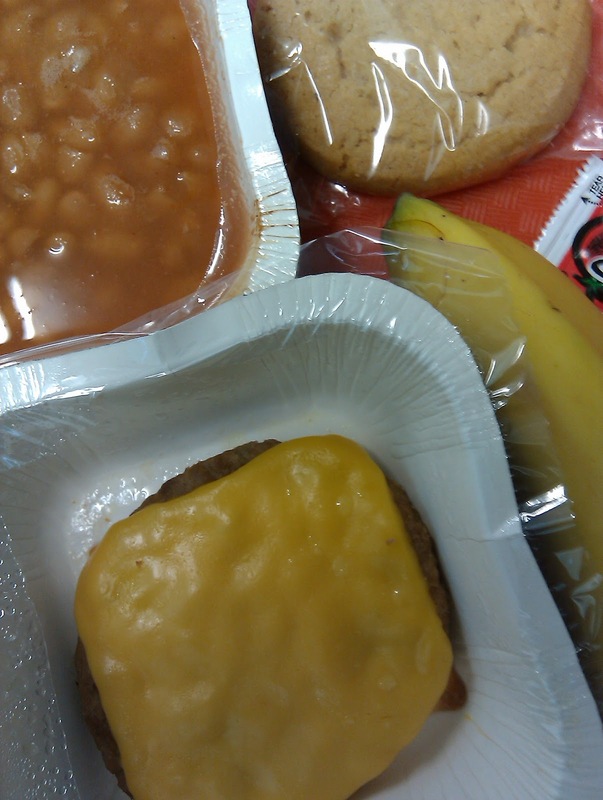 Doesn't look too bad for a school lunch but sure would like to see more vegetable options. Hi Mrs. Q. Do you only get one choice? At my school, we lunch ladies serve 2 (usually hot) choices each day. 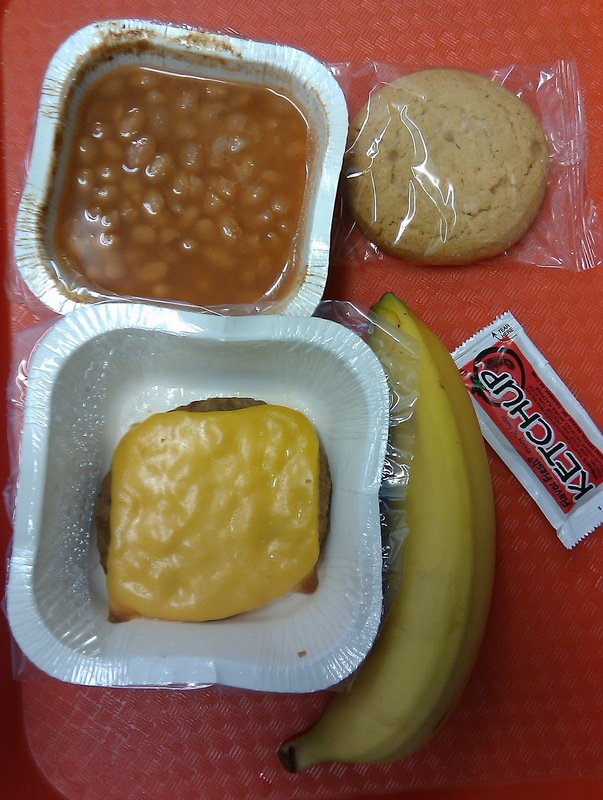 Also offered daily is a cheese sandwich, PBJ or a chef salad as alternatives. On Fridays (pizza day) we always offer some kind of cold cut sandwich alternative. I see too that the kids there don't have a choice as to cheese or no cheese on their burger. I have a lot of kids that can't have cheese due to allergies, so we can give them a burger without it because we serve out the food by hand. It's not packaged like yours. (shiver down spine). But we still don't have whole wheat buns which is something I'm still waiting for in my district. A banana! Fantastic, except, it looks like it might be hard to get started…you to to peel it. Do they make a little cut to help the kids along? they should totally do that to the oranges too. I don't have a twitter acct. I have thought about it, but just don't know if I would use it. Or if anyone would be interested in anything I had to say. Yes, I tweet too and completely agree that I've connected with folks who I would have never met otherwise. I've been in a restaurant before and had someone tell me that I look familiar – why? we follow each other on twitter. I love my twitter account, but I have to admit, I've been bad about keeping up with it of late. When things get busy, twitter's one of the first things that seems to get dropped. I have my personal Facebook account and pages for both my blog and the store I'm opening in January, and I just seem to get more interaction there than I do on twitter. However, twitter is more open to interaction with folks you haven't met in real life, I've noticed. There are so many other writers, moms, and marketing experts I've been able to speak with via twitter that I never would have come across on Facebook. And they link to fun, useful, or just plain interesting articles all the time that I wouldn't have found otherwise. Both are great resources, but they can also take up a LOT of time. I didn't know the Facebook page wasn't yours!!!! Because of you I asked my doctor yesterday to add a gluten allergy test to my regular blood tests. We'll see what happens! I've started tweeting recently, and don't quite have the hang of it yet. It's good to read what others are thinking and doing around it, too. And, I really like your quote. As a writer/farmer/gardener, I would say Eisenhower hit the nail on the head. Thanks for sharing! The meal looks somewhat appealing. I remember when I was in school there was no option for the buns. The hamburger/cheeseburger came on a bun, and usually they were fused somewhat to the bun and the edges were usually very quite crisp. 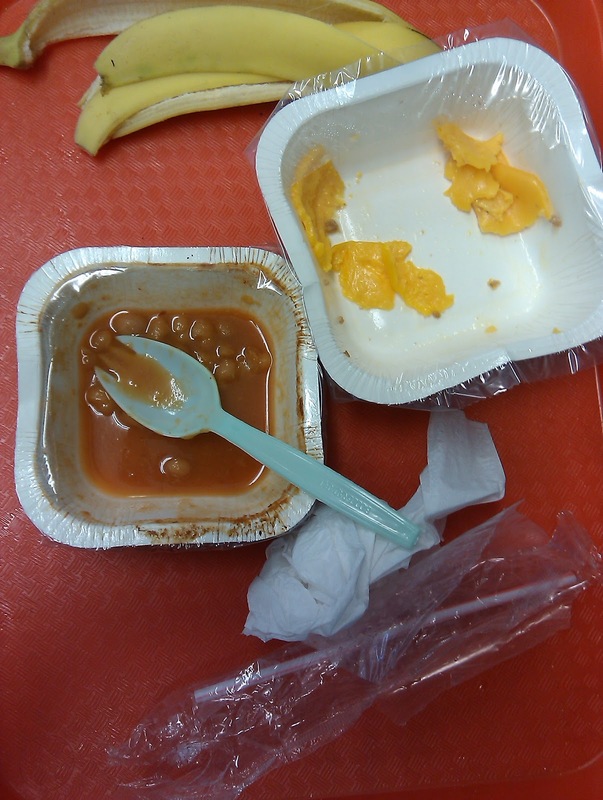 That was one of the only meals that I would eat at school that I would not eat at home. I was in junior high before I would really eat homemade hamburger because my mom would always mix onion soup mix into the meat. I've never really been able to get into tweeting. It really seems like voyeuristic texting.